A trio of holiday shows — "Matilda the Musical," "Annie" and a "Wonderland" matinee at Can Can — provides, in turn, empowerment, escape and eggs Benedict with a side of high kicks. Holiday shows are traditionally about entertainment and escape, but how about a little empowerment, too? That was my thought when I browsed this year’s crop of family holiday shows in Seattle, which included two musicals with a spunky girl protagonist. I have long wanted to see “Matilda the Musical” and have huge “Annie” nostalgia (more on that later). And like most parents, I am drawn to twofers — can we be entertained and expose the child to an Uplifting Message? — so I was curious to take my 9-year-old son. As a wild card, I threw a very different show into the mix: The all-ages “Wonderland” brunch at Pike Place Market’s Can Can club, which was billed as family-friendly, lighthearted fun. The twofer here was: You get to eat, too. A song titled “Revolting Children” is probably not what you were expecting for your home’s holiday soundtrack. But if you see Village Theatre’s production of “Matilda the Musical,” it might just be what you get. Based on the Roald Dahl novel, “Matilda the Musical” stars the spunkiest, craftiest, most empowering young heroine since, well, ever. Matilda (a role performed with quiet fierceness by Holly Reichert on the night we went) is a thoughtful, book-loving British girl born to Mr. and Mrs. Wormwood. The Wormwoods, in contrast, are a TV-loving, money-grubbing couple who think their bookworm daughter is truly “revolting” (among many other insults). When they send Matilda to the local prison-like school — headed by a torture-loving principal named the Trunchbull, played in hilarious drag by Basil Harris — Matilda begins to revolt in earnest. She organizes the schoolchildren and sweet-but-cowering teacher Miss Honey to overthrow the Trunchbull as well as other evil adults who stand in their way. Let me count the ways my family loved this musical. The Wormwoods — dressed in garish, ’60s-style neons and plaids — are hilariously evil. Songs are by turns poignant, laugh-out-loud funny and rousing anthems. Bit characters are so good they steal scenes: Matilda’s librarian friend (Shaunyce Omar) who squeals with joy when Matilda spins a serial, thrilling tale; a hip-gyrating ballroom dancer named Rudolpho who trains the audience to laugh whenever he shows up; and a schoolboy named Bruce who is forced to eat an entire chocolate cake by the Trunchbull. There is magic, and the Russian mafia. Warning: The humor can be very dark — Matilda’s parents are no-holds-barred abusive, including stating repeatedly they wished Matilda was a boy. This might be too much for some kids (and parents), but my 9-year-old son got the humor and adored it. The production isn’t perfect. 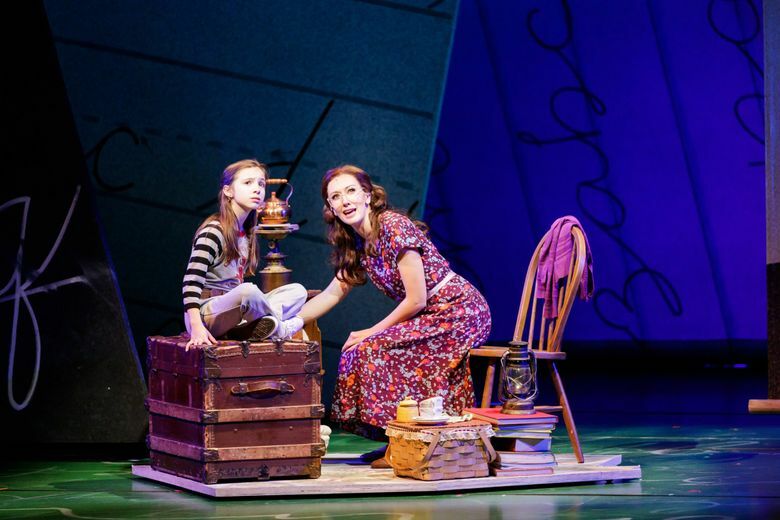 It can be hard, for example, to understand younger cast members’ lyrics at times, but to give them credit, they have the dual challenge of putting on British accents and doing all the regular singing and dancing required. The cast includes 14 children under the age of 12. 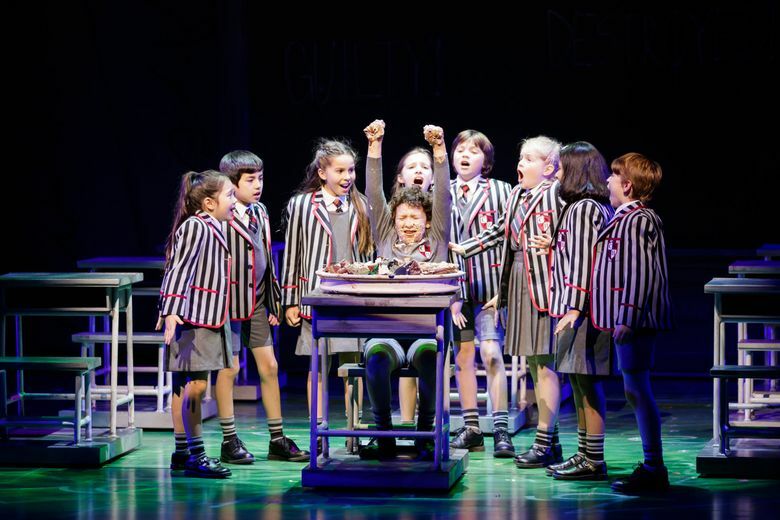 Bottom line: Village Theatre’s “Matilda the Musical” excels in entertainment and message — about the power of stories and of standing up for justice, no matter how little you are. Confession: I was so into “Annie” as a middle schooler that I directed neighborhood kids in a production of it that we performed (to big applause, I might add) at the nursing home where my mom worked. The funny thing is that decades later, I could remember very little of the plot. 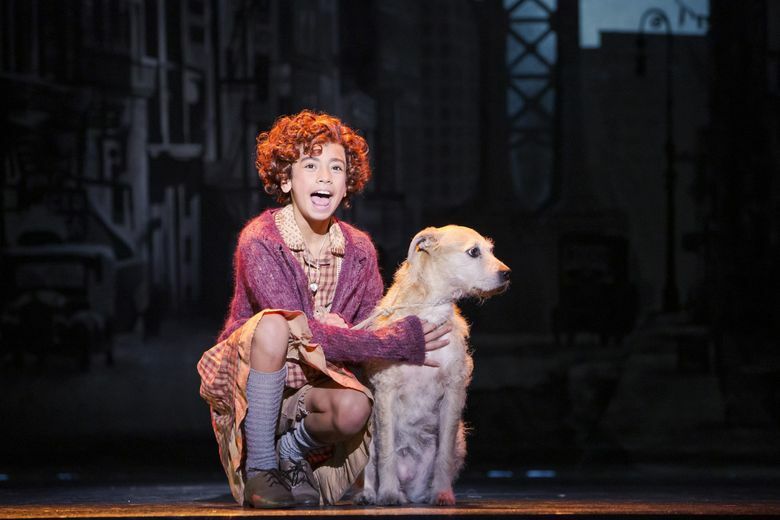 The main character was an orphan in New York City during the Depression and she found a dog named Sandy and she ended up being adopted by a rich guy named Daddy Warbucks, but … what else happened? 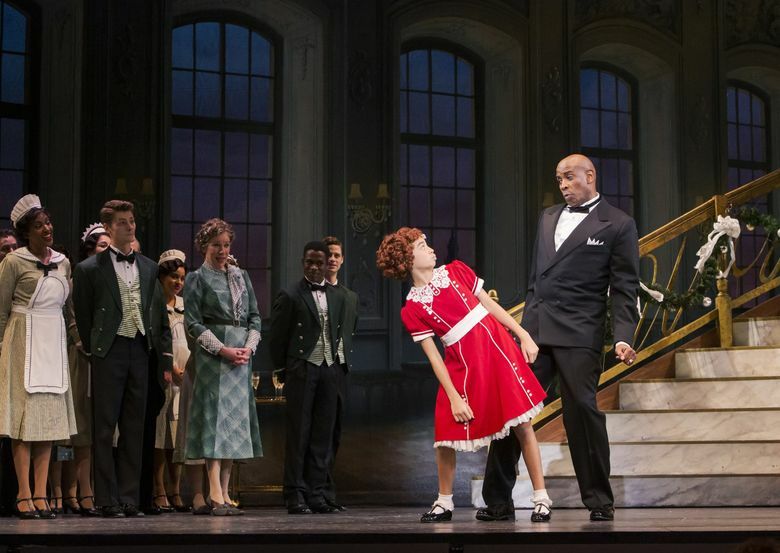 Let’s just say up front: The 5th Avenue Theatre’s production of “Annie” shines like the top of the Chrysler building. The sets — depicting New York City scenes ranging from Warbucks’ Fifth Avenue mansion to St. Mark’s Place to the Rockefeller Center — are sumptuously detailed in vintage glory. Performances are strong throughout, especially local talent Visesia Fakatoufifita, who gave a perfectly tuned performance as Annie the night we attended (she is from Puyallup and shares the role with Faith Young, from Kent), realizing her solos effortlessly. “Annie” also simply feels like a festive holiday show, from the moment you walk in and see the ceiling-high beautifully decorated Christmas tree in the 5th’s ornate lobby. And indeed, both of my companions (my son and his 10-year-old cousin) thoroughly enjoyed it, especially the scenes with the orphans (“Hard Knock Life”) and Franklin Roosevelt (Tony Lawson), who forces his entire staff to sing “Tomorrow” during a scene in which he learns a lesson about unfailing optimism from Annie. But though the casting has thankfully become more diverse since the musical debuted in 1977, and this production has toned down some of the stereotypes woven through the plot, the stereotypes are still there: A young orphan is rescued by a wealthy man (Timothy McCuen Piggee) who shouts orders at everyone around him. Mean orphanage director Miss Hannigan (played with evil verve by Cynthia Jones) is a flask-sipping spinster who longs for a man to “nibble on her ear.” The production glows, but the story — says this “Annie” fan, with a heavy heart — feels dated. The “Wonderland” brunch matinee at Pike Place Market’s historic Can Can club, was — the publicist assured me — completely family-friendly, though not specifically aimed at kids. This was true of the Sunday matinee we attended, but since my son and his friend (ages 9 and 8, respectively) were the only kids in the audience, and because we happened to be sitting right on the catwalk portion of the stage — they were also fair game. By five minutes after the show started, the white-sequined M.C. had found out the boys’ names, what they wanted for Christmas and how they had ended up in a moodily lit speakeasy-style club underneath Pike Place Market (“my parents made me come,” my son said honestly). By the end of the show, they were pulled up on stage to be doused with confetti and pose for pics. Which they (mostly) liked. 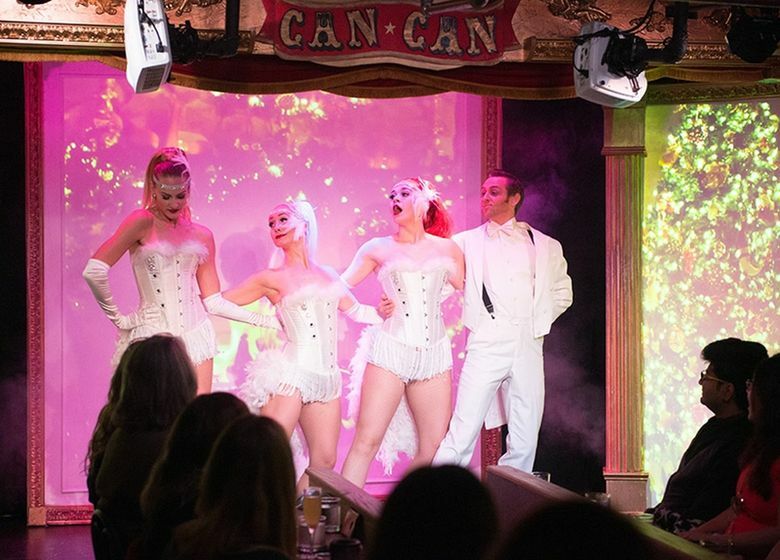 This is the appeal of a matinee at the Can Can: custom cabaret-style shows in an intimate setting. Five performers kick, swing, dance and sing through various holiday numbers while wearing many tight (though not really low-cut) outfits of feathers, fishnet, sequin, glitter and even argyle socks. Numbers included campy versions of holiday songs (“Baby, It’s Cold Outside” where the girl pleads with the boy, who turns out to be gay). And as promised, unlike other Can Can shows, the content was generally kid-appropriate — the kids declared the show, respectively, “awesome” and “pretty good” — and the few innuendos shot over their heads. A quibble: The volume had one setting: LOUD. 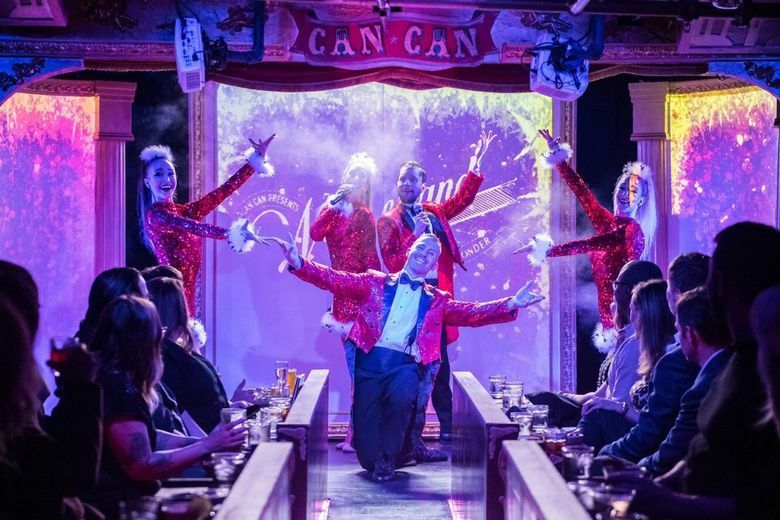 Bottom line: Though it won’t be everyone’s cup of tea, Can Can’s “Wonderland” matinee is glittery, campy cabaret fun, with no uplifting messages in sight. Tip: Bring cash for tipping the performers.